Each month throughout the school year, the WIAA recognizes middle level students from around the state who exhibit the core principles of the middle level sportsmanship program: honor, sportsmanship, courage, respect, and citizenship. These students have helped develop positive team attitudes; and encouraged, cooperated, and collaborated with their peers. Click the link below to login to your MyWIAA account as an athletic director or coach, then click "Give Me 5 Star Student of the Month Nomination" under My Tasks. The “Give Me 5” Sportsmanship Program builds upon the WIAA’s current efforts to promote and recognize sportsmanship among our teams, schools and communities by awarding middle level schools that meet the award criteria with the distinguished All Star School Award. The All Star School will receive a gold star recognizing the school’s outstanding efforts in promoting sportsmanship in and out of competition. The program’s criteria helps provide a consistent message of behavior for participants and fans to create a healthy culture at all contests throughout the state. An online application will be emailed to principals the first week of May and must be submitted by the last Friday in May annually. Qualifying schools will receive the All Star School gold star to add to their “Give Me 5” Sportsmanship Banner along with an award certificate in August. To qualify for the All Star School and receive the gold star, a school must complete all of the following items during the school year. 1. 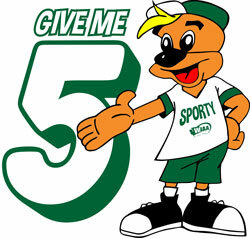 School must display their “Give Me 5” School Sportsmanship Banner throughout the school year. sportsmanship in an orientation/meeting with players and parents. 3. School must have zero ejections for the year. will be expected and enforced at sporting events. system are available. The sportsmanship announcements are available HERE. assembly that promotes a healthy culture. 9. School must have at least two students participate in a school, league/district or statewide leadership conference. practice” for promoting sportsmanship, along with one area that needs improvement.